WORD FOR THE DAY from Gratefulness.org. A life practice from Br. David Steindl-Rast. “Word for the Day” from Gratefulness.org is one of my favorite long-standing daily spiritually-oriented emails. Br. 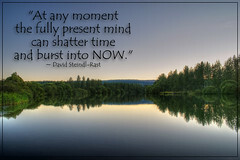 David Steindl-Rast is a gem! I am posting this because I need the reminder!